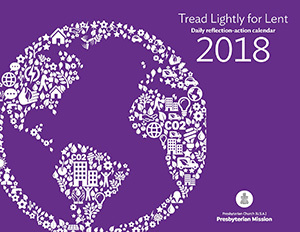 The Lent 2018 daily reflection- action calendar, “Tread Lightly for Lent,” is now available. The calendar was created by the Presbyterian Hunger Program’s Environmental Ministries and Enough for Everyone offices. In Lent, we reflect on Christ’s ministry, death, and resurrection. We slow down, take time, and examine our internal spiritual lives and the way we live out our Christian faith in the world around. This Lenten calendar begins with ways to prepare ourselves for the Lent and Easter season and then moves to weekly foci of women, creation, water, consumption, and social justice. Ideas for action can be used by congregations as well as individuals.